Thankfully in much of the UK we rarely get lots of snow. In recent winters however, we have seen some heavy snow that has hung around for DAYS. 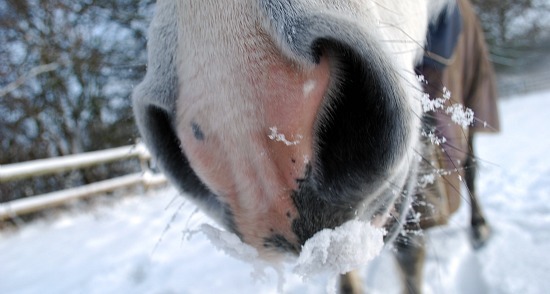 These are some of my tips for looking after your horses during the cold/snowy weather. 2. Think about what you’re going to do water wise. Nowadays my horses are at home so if everything’s frozen I simply take the watering can inside the house and fill it up. When I used to be a livery yard they gave no thought to water supply whatsoever – if the water was frozen it was a case of tough. I used to fill up pop bottles with water at home and then take them to the yard in my car. 3. 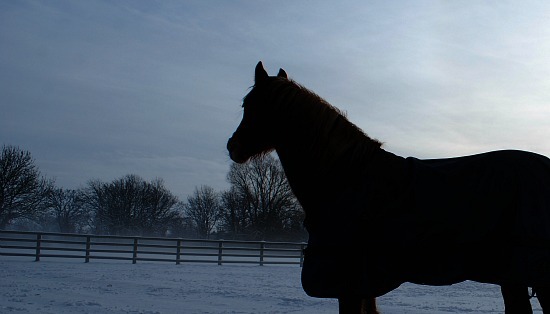 Keep them warm – if you rug your horses make sure you do it well during the cold spell. 4. Don’t feel you have to keep them in. When it’s snowed heavily I still turn my horses out. They like to stretch their legs and as long and as I dump a load of hay in the field they are quite happy munching it. I don’t tend to turn them out as long as normal though, as they get bored after so long. 5. Make sure their feet are picked out – sometimes when you bring them in from the snow it balls up in their hooves, I take a hoof pick in my pocket to help if this happens. I also grease their hooves with hoof oil before turning them out – it stops the snow sticking as much. Mmmm... this snow tastes good! 6. If it’s icy and I have to lead my horse somewhere I keep a store of table salt in the barn. It’s not as messy as grit and does the same job. 7. Remember to wrap up warm yourself – layers are the key.